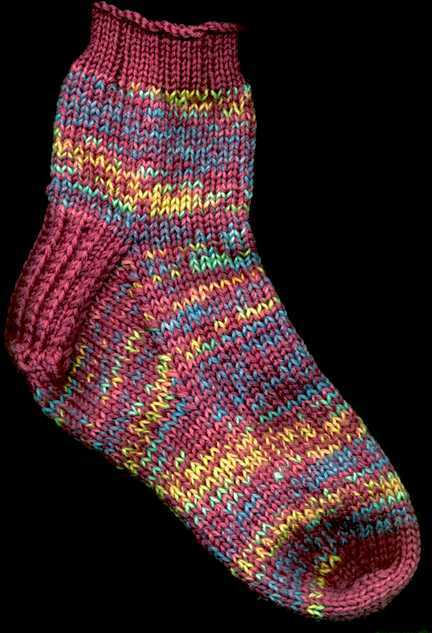 Done from the ankle down and then the cuff last :-) The two tone part is leftover Lorna's Laces Baby pastels and the bright pink (used with the LL and doubled with itself for the heel and toe) is a washable 100% Italian wool...nice and soft... Done on size 5 needles. Cuff was done in K4P1 ribbing because I really dislike ribbing in the round...single strand of the pink using size 3 needles for the cuff only. They really don't look QUITE this bright in person. And I always do both at the same time on two sets of five dpns.